Today I want to start a new series of illustrations: Ladies in Vogue, a series of portraits of the women who work for the various editions of the international fashion bible. Maybe not a strict men’s fashion subject as my topics normally are, but a great subject nonetheless. And it was imperative I’d start with the woman I admire the most among those, a woman that signifies elegance with every cell of her body, who wears barely any make-up and rarely steps out in any colour but black, who doesn’t need crazy gowns to exude sheer class: Grace Coddington, creative director of American Vogue. Some of you might think it’s an odd choice, as her boss and editor in chief of American Vogue, Anna Wintour, would have seemed a more logical choice to start this series. 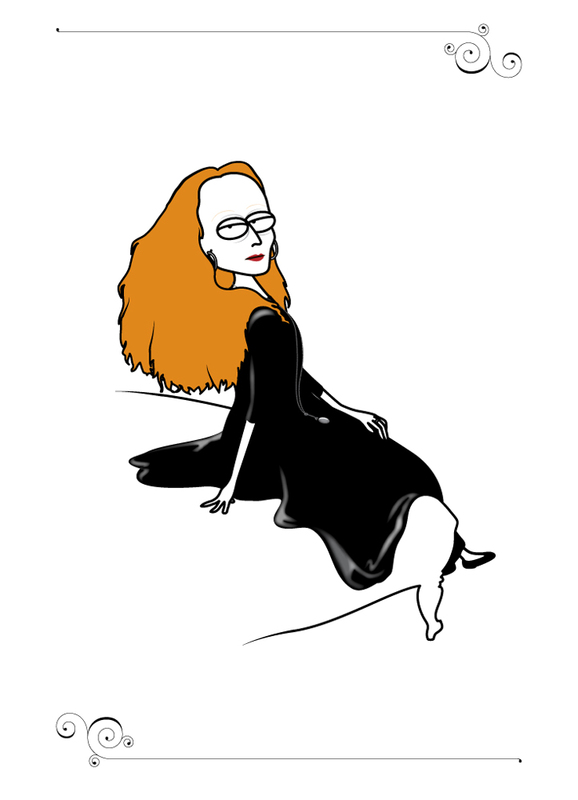 But whoever has seen The September Issue will agree with me that the real soul of Vogue is in fact Grace Coddington, the one that injects real elegance with her wonderful creative input and painfully beautiful photo shoots. The woman is elegance itself.